Bacillus cereus is a species of bacteria that causes severe food poisoning. As its name suggests, it is a rod-shaped bacterium; it is also gram positive. It was only recognised as a bacterial cause of food poisoning in 1955 and probably only accounts for about 2 per cent of all food-borne illness in the industrialised world. Although is not as common as Salmonella or other bacteria species that cause food-borne illness, this bacterium is very specific in the types of food that it contaminates. B. cereus is present in the outer casing of rice and, because it is able to form spores that are very resistant to low or high temperatures, it can easily survive cooking and less-than perfect refrigeration. The spores are also known to be able to withstand pasteurisation, so this bacterium is of special concern for the food industry responsible for the production of processed cook-chill foods. When rice is boiled and then stored in the fridge without being cooled first, these spores can germinate on the cooked rice and grow well at 4 degrees Celsius. If the rice is then used in a stir fry or similar dish, where the cooking time is relatively short, enough of the bacteria survive to be ingested. 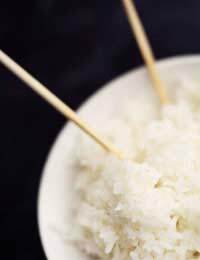 It is well-known to occur in people who eat take-away foods that include rice dishes. Does Bacillus Cereus Affect Other Foods? Yes, its not just rice, this is just the most well known example of foods that can become contaminated. Other cooked cereals such as cous cous and bulghur wheat can also be affected, as can pasta, potatoes, pastries, any foods with sauces, such as casseroles and pies. Even salads have been found to harbour Bacillus cereus spores and actively growing bacteria. What Symptoms Does Bacillus Cereus Cause? Bacillus cereus causes severe food poisoning of two different types. The form that produces diarrhoea is accompanied by symptoms that are virtually indistinguishable from those caused by Clostridium perfingens bacteria. The affected person experiences abdominal cramps and severe watery diarrhoea within about 15 hours of eating the contaminated rice. Vomiting rarely occurs but the diarrhoea carries on between 1 and 2 days. Some strains of the bacteria have an extra plasmid that carries a gene for a toxin that causes severe vomiting. These strains cause the emetic form of Bacillus cereus and produce symptoms very similar to food poisoning by Staphylococcus aureus. After ingesting rice contaminated with these strains, vomiting begins between 1 and 5 hours. The effects are fairly short-lived and the digestive system usually returns to normal within about 24 hours. The steps that are required to avoid food poisoning with Bacillus cereus are the same as those needed to prevent any type of bacterial food poisoning. When preparing food, use good hand and surface hygiene, ensuring that raw meat juices never contaminate cooked foods that will be eaten without reheating. Always defrost frozen foods in a fridge for several hours, rather than leaving them at room temperature. When storing cooked foods for reheating, cool them quickly and store in a fridge that is kept below 4 degrees Celsius. On reheating, make sure that the food is heated to at least 100 degrees Celsius, and is piping and consistently hot throughout.